Microsoft announced this week via its official website quietly that the opportunity for Windows 7 users and Windows 8 systems to get the new version of the operating system Windows 10 free upgrade is almost finished, as the company stated via the technical support page that there is a specific date for the end of the presentation Upgraded to the latest operating system at no cost, 31 December December 2017. This announcement comes after Microsoft (wikipedia) has provided the latest version of its operating system called Windows 10 free of charge to users of previous versions of their systems Windows 7 and Windows 8 for more than a year, also helped the gap that previously appeared on the extension of the time frame from last July to date. 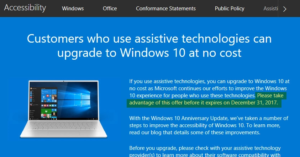 The company had technically terminated the free upgrade program to Windows 10 on 29 July 2016, but it made an exception for those who use accessibility features, such as Braille screens, screen readers, and other additional assistance. The intention was to allow those users who use an earlier supported version of Windows to get more time for the features arriving to be able to deal with the new operating system, but there was no definite deadline for promotion under the circumstances. It helped anyone from Windows 7 system users or Windows 8.1 to activate accessibility features and obtain the approval of Microsoft (Microsoft news) to upgrade the system free of charge without no problems, and this seems to be nearing completion, and less than two months remain on the end of the time allowed to get The upgrade is free even for users of technical auxiliary devices. Reports indicate that this announcement is unlikely to significantly affect the deployment of the operational system, especially after a long period of time to provide free upgrade, but it is an important milestone by representing the official end of the company’s attempts to update and standardize the operating system user base Windows by removing the price barrier, where Windows 10 was supported fast enough while having a free upgrade. 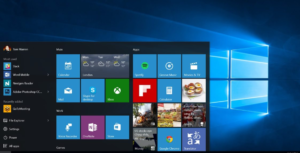 Market research company NetMarketShare pointed out the market share of the Windows 10 operating system with regard to the market for computers from 9 percent in November 2015 to 29.3 percent in October 2017, but Windows 7 still has a dominant version of 46.6 percent with a decline of less than 10 in a For a hundred during that period.